There are lots of new animal and bird album cover designs around, so I thought I'd kick off this latest run with just birds. A couple are truly iconic images focused on the bird as an image, there are a few hummingbirds and owls, and quite a few with birds more as an incidental, sometimes two-dimensional part of the design. The first two have a similar feel, in spite of very different intent and music styles. 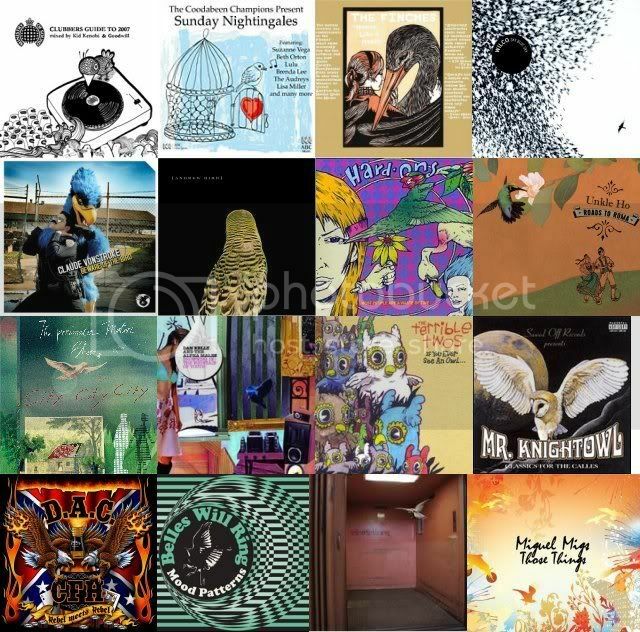 The Clubbers Guide is a favourite - bird as a simple, imaginative device engaged with the concept - as is Andrew Bird's snooty budgie, which captures the witty spark of his music well. As for that Wilco cover, that is pure genius, capturing a mood perfectly in the most stylish way possible - a picture that says so much, both in content and design, and a very powerful image. Those owls on The Terrible Twos are way cute - let me know if you're recording a CD and want a cartoony design along those lines (or even a naturalistic cover illustration) - I'd like to do one. City City City - The Perimeter Motor Show - mostly instrumental with diverse instruments and a jammy, occasionally dissonant sound. I like this a lot! The Terrible Twos - If You Ever See an Owl - Something different from Matt Pryor (of Get Up Kids) and the New Amsterdams, a cool, hook-laden children's album! Belles Will Ring - Mood Patterns - Chiming and melodic debut recorded in our own Blue Mountains by a rising star band! 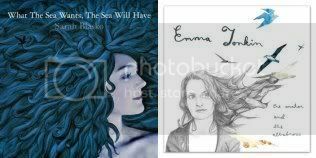 I thought about starting a separate category for female artists with birds in their hair, as demonstrated here by Sarah Blasko on What the Sea Wants the Sea Will Have and Emma Tonkin on The Anchor and the Albatross. These capture the vibe and themes of the respective albums perfectly, intelligently incorporating images of the artists themselves and the other elements (I hate albums that just have a boring photo of the artist on the cover). Last but not least there is Hatebeak, the death metal band from Maryland, whose lead singer is an African grey parrot named Waldo (smart species, the African grey). The cover itself is evidently a tribute to Judas Priest. Waldo records separatelyfrom the band, due to a sensitivity to loud noises, so don't expect a tour. With the CD singles sold out, an album is in the works. Those are great album covers, the women's hair being my favorite. I agree with you, too, about how boring album covers are when it's just a photograph of the group. I prefer a little more creativity!